Another month, another Lush collection. Or in this case, two. Last month saw the release of the Valentine's range, and as soon as I saw the Mother's Day and Easter products I knew I had to splurge. It's no secret that I love their bath bombs and bubble bars by now, and you all seem to love the reviews! The first I've tried from the new releases is the Wonder Woohoo bubble bar. Wonder Woohoo is inspired by Wonder Woman, and to be specific, her golden tiara. 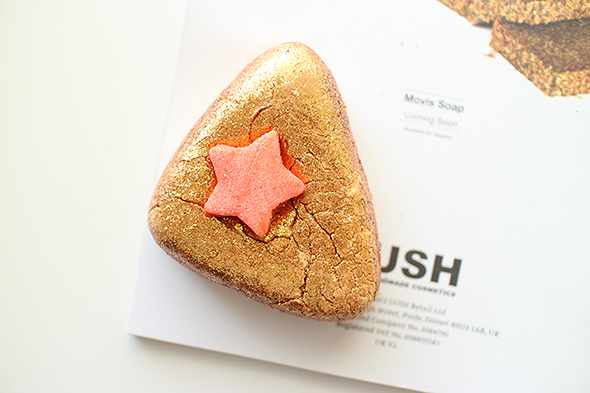 It's one of those Lush products that's absolutely covered in gold lustre, so it's one to avoid if you're not a magpie for glitter. I however love the stuff, and three of the six products I bought actually contain some sort of shimmer. It's has the same scent one of their Gorilla perfumes, The Sun - sweet orange and mimosa with a touch of sandalwood. It's zingy, but not overly so. Rather refreshing in fact. I only used half of this and ended up with a bathtub of bubbles, so it's definitely a more than one use kind of bubble bar. There wasn't much of a change in the colour of the water - sort of a dirty gold, but this could probably be intensified by using the whole thing. Now, onto the important question. Did I need to spend half an hour scrubbing the bath out afterwards? The answer is no. A quick hose down with the shower and all the glitter left lying in the tub was rinsed away. No scrubbing required. Wonder Woohoo is pretty similar to Sunnyside, in terms of both appearance and scent, but this is slightly bigger and easier to use on more than one occasion. I also find Sunnyside slightly more citrusy. If you like your glitter and fruity scents, definitely grab this while it's available. I love Lush products and like the look of Wonder Woohoo but don't know about all the glitter in this one. Definitely going to keep a look out for the new collections this month though! I love the look of this, can't wait to see the new collection in store! I can never leave without having a little splurge! This is so pretty Amy. I'm planning on a trip to LUSH in the next few weeks, I may have to have a look at these new releases. I love lush products so much, and this product looks divine! Cant wait to go on a shopping spree! It looks so pretty! I'm so looking forward to the Easter collection! This sounds so lovely! I've run out of bath bits so I need to pay a trip to Lush pronto! What a beautiful photo of Wonder Wooho! I've yet to try a bath bomb myself. But I love love love Ro's Argan Body Conditioner ♥ Have you tried that one? I highly recommend!